How much does it cost to travel to Mongolia? How much money will you need in Mongolia? ₮51,043 ($19) is the average daily price for traveling in Mongolia. The average price of food for one day is ₮15,495 ($5.92). The average price of a hotel for a couple is ₮39,331 ($15). Additional pricing is in the table below. These average travel prices have been collected from other travelers to help you plan your own travel budget. How much money do I need for Mongolia? Mongolia is best described as the world's largest campground. It's low population density, nomadic culture, and lack of infrastructure mean it offers a unique experience that is centered around outdoor living and breathtaking scenery. It's a surprisingly diverse country with landscapes that range from the desert to the steppe and the lake regions in the north. Mongolia has an untouched, pristine feel that gives you the impression that you've stepped into a country untouched by modern technology. The people are incredibly welcoming, proud, and impressive in their adaptability. One night you can experience sleeping in a Ger (or Yurt) with a local family while you sip some camel milk tea. The next night you'll sleep under the open sky with more stars than you ever imagined possible. Winter months are incredibly cold and harsh, so it's best to visit during the short summer months. You could also time your visit to overlap with the annual Nadam Festival. The Nadam Festival is a national event that includes games, sports, and activities. The largest component is held in the capital city of Ulaan Batar, but smaller towns also host their own versions throughout the country. If you do plan to visit during the Nadam Festival, it's important to make reservations in advance. This is easily the most popular time to visit Mongolia, and the crowds will be at a peak. While very few tourists actually visit Mongolia, those that do almost always come during the warmer summer months. You'll likely find a concentration of travelers in Ulaan Batar either planning their trip or recently returning from their trip. The people of Mongolia are some of the most lovely and welcoming people you are likely to encounter. Despite living a subsistence life, they are incredibly proud and accomplished people. 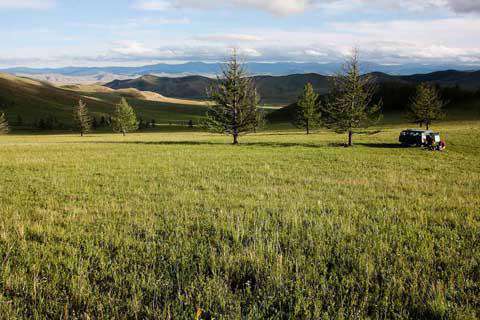 Get to Mongolia now, because it won't be long before it's no longer an undiscovered destination. Mongolia is generally a very cheap destination. You essentially have to do a tour as there is almost no internal transportation infrastructure. This means independent travel is virtually impossible. Tours vary in price depending on the length of the trip, the number of people, the comfort level, and the tour company you book through. It's easy to join a tour once you arrive in the country. This is the best way to ensure your costs are reasonable. It does require some flexibility as you need to find a group going to the places you hope to see in the same time frame you're hoping to take. It is almost essential that you do a tour while you're in Mongolia. There is almost no public transportation and roads in many parts of the country are little more than tire tracks. You can organize your tour after you arrive in Ulaan Batar. Hostels in the capital city are usually the best place to organize everything. If you're in the country during the summer months then you likely won't have any trouble finding people to join your trip. Tours through Mongolia can range dramatically in length. Most people choose to do about a ten day tour as this allows enough time to get outside of the immediate vicinity around Ulaan Batar, but is still not too time consuming. If you're hoping to see more of the country you'll need at least two or three weeks. It may be more challenging to find others to join your tour if you go for this longer time period, but it will be well worth the effort as you will see so much more. Before leaving for your tour it is a good idea to stock up on snack food. Most guides prepare food for travelers and although the food can be quite good, it can sometimes become monotonous. You'll appreciate having snacks with you during your time outside of the city. It's not necessary to bring any camping equipment with you as most travel agencies will provide it free of charge. Do check the quality of the equipment prior to your departure though to make sure no parts are missing. Be prepared to camp. Even though you may spend several nights in ger camps, these are still little more than tents. Weather conditions vary dramatically throughout Mongolia so be prepared for almost anything. That's likely what you'll get. Erdene Zuu Khiid: This is the first Buddhist monastery in Mongolia. It is located in Kharkhorin and has between 60 and 100 temples on its complex. It also has about 300 gers inside its walls where monks reside. At its peak it housed about 1000 monks. It's a great place to visit if you want to learn more about religion in Mongolia. Khovsgol Nuur: This beautiful lake is surrounded by breathtaking mountains. It's located in the north of Mongolia and is the largest lake in the country. It's also the third largest lake in the area. It's an absolutely beautiful, although difficult, place to visit. Mandshir Khiid: Just an hour outside of Ulaan Batar, this famous monastery is in a beautiful setting. It provides a home to 350 monks and is a pleasant place to visit. It's easily accessible and is a good stop off while you're in the country. People generally don't visit Mongolia for its cuisine. The traditional dishes are usually meat and potato based and there is very little seasoning added. In Ulaan Batar you'll find plenty of western style restaurants that serve all different types of food. When you're out in the countryside you'll more likely be dining on stew like dishes that are made with lamb, potatoes and tomatoes. Buuz: These are the Mongolian version of steamed dumplings. They are filled with meat, most often lamb and flavored with seasoning. They're often prepared for celebrations or during the Nadam Festival. They're a favorite around the country and one of the most delicious Mongolian dishes available. Guriltai Shol: This is a noodle, meat, and vegetable stew that is common throughout the country. It makes for a hearty and filling meal. It is often well cooked and seasoned with garlic and onions. Airag: This national drink is made from fermented mare's milk. It has a very distinct flavor and should be sipped with caution. It's usually offered to visitors after arrival in a Ger. Although alcoholic in nature, do not attempt to get drunk off of this drink. Mongolia is one of the most difficult countries to get around. The most realistic way to fully experience the country is to take a tour. Most tours include a driver, vehicle and a guide who also serves as your cook. Book your tour once you're in the country, so you can join other travelers and be picky about your itinerary.